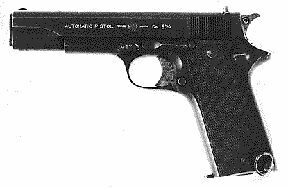 The 1922 was the first of the 1911-pattern pistols to achieve much success. It was manufactured for commercial sales as the Model A and was made in 7.63 mm Mauser, 9 mm Largo, .38 ACP and .45 ACP. A few patented selective-fire model ADs (similar to the later MD, below) were made from these designs as well. The 1922 is much more similar to the Colt than the 1920 was, and has the safety back on the frame in its normal location, a Colt-profiled slide, and the arched mainspring housing of the 1911 A1. A number of other improvements were made to the frame, presumably to increase the strength and ergonomics. The leaf spring used in the colt was replaced with a series of coil springs and there is no grip safety.